My little buddy! FluffPup the peanut butter frosting dog! The party inspiration. 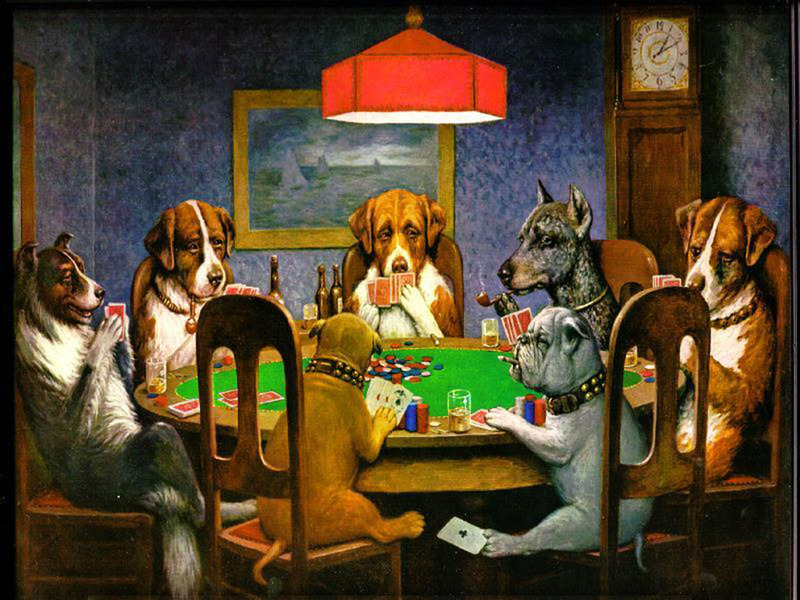 Dogs playing poker poster. I made dog masks out of felt for my hubby and I! Hangin’ with Amy’s cat Dooblevay! One of my best friends, the crazy talented Amy P, had a “dogs playing poker” themed birthday party, based on that ridiculously amazing poster from the 1980s!! So as a surprise I made her a dark chocolate cake with chocolate ganache filling and PEANUT BUTTER frosting. Extreme deliciousness alert! And… it was also vegan, as she can’t eat dairy! I tried to base the dog on the supercute little pup from the hilarious movie Best In Show. I made dog masks for Rich and I out of some leftover felt and a few spare headbands I had lying around! Et voila… maybe the scariest dog masks ever?? I tried to make them cute but really, when you cut holes out of anything and put it on your face… horror movie material! I went for a “jaunty jazz dancer dog” look with a black and white themed outfit with white gloves…! The last pic is of Rich and I posing with Amy’s amazing fatcat Dooblevay! I love your cakes so much! This one is so cute! So funny. Your parties look like fun! Fledi, I was in Munich this summer for a wedding… there are different kind of cakes in Germany… but so special too! Thanks for stopping by. So cute, Lyndsay! Thanks for visiting my blog and leaving such sweet comments. I also adore your work and blog–beautiful!